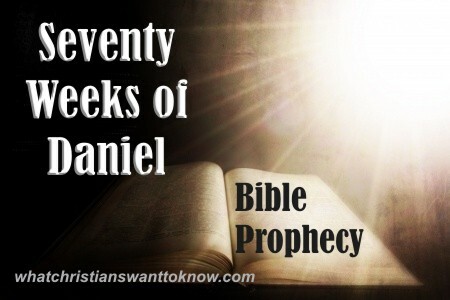 What Are The Seventy Weeks Of Daniel Prophesied In The Bible? What are these seventy weeks that are mentioned in the Book of Daniel? Have they come to pass or are they yet to come? Daniel was a young teenager when he was taken into captivity along with the rest of Judah but Daniel obeyed God and blessed everything that he put his hand to. God gave him favor in the eyes of King Nebuchadnezzar. Even as a young teen, “Daniel resolved that he would not defile himself with the king’s food, or with the wine that he drank. Therefore he asked the chief of the eunuchs to allow him not to defile himself. And God gave Daniel favor and compassion in the sight of the chief of the eunuchs” (Dan 1:8-9). Daniel would eventually rise second only to the King because God blessed him for his desire to obey Him, even if it meant death. Daniel covers a lot of prophecies; some that have come to pass, some not yet. At least we don’t think all of them have been fulfilled yet. Many Bible scholars have one way of seeing the so-called “Seventy Weeks” but a few have another. We will try to explore both camps and let you make your own conclusion as to what is the meaning of the “Seventy Weeks” in the Book of Daniel. And God gave Daniel favor and compassion in the sight of the chief of the eunuchs. The number Seventy seems to come up frequently in the Bible, even back in Genesis where “If Cain’s revenge is sevenfold, then Lamech’s is seventy-sevenfold” (Gen 4:24) and after Jacob’s death “the Egyptians wept for [Joseph] seventy days” (Gen 50:3). There were “seventy of the elders of Israel” (Ex 24:1) and Israel entered “Egypt seventy persons” (Duet 10:22) but came out in the millions and Judah’s exile for seventy years in Babylon. Seventy seems to come up in the New Testament too as we’re told to forgive others “seventy times seven” (Matt 18:22) by Jesus so the number seventy seems to be an extension of seven but ten times greater. Seven is the number of completion so then seventy is that much more complete. It pictures God’s complete judgment on Lamech and on disobedient Judah, the completion of mourning for the Egyptians, the completion or fulfillment of forgiveness (70 times, not just 7). What then is the meaning of Daniel’s seventy weeks in Daniel chapter 9? After Daniel’s vision, he writes that “Gabriel, whom I had seen in the vision at the first, came to me in swift flight at the time of the evening sacrifice. He made me understand, speaking with me and saying, ‘O Daniel, I have now come out to give you insight and understanding’” (Dan 9:21-22) and what was this insight? Gabriel explains the meaning of the vision to Daniel and says, “Seventy weeks are decreed about your people and your holy city, to finish the transgression, to put an end to sin, and to atone for iniquity, to bring in everlasting righteousness, to seal both vision and prophet, and to anoint a most holy place” (Dan 9:24). The “holy city” is obviously Jerusalem and the one “to atone for iniquity” who brings “everlasting righteousness” is clearly Jesus Christ. This much is easy to know but what is “the transgression” that first must be finished? Does putting an end to sin mean putting an end to the sinful one, the Devil? Gabriel continued his message to Daniel by telling him, “Know therefore and understand that from the going out of the word to restore and build Jerusalem to the coming of an anointed one, a prince, there shall be seven weeks. Then for sixty-two weeks it shall be built again with squares and moat, but in a troubled time” (Dan 9:25). Seven weeks in years would be 49 years and sixty-two weeks would be 483 years and from that time, 457 B.C. to A.D. 27, which was when Jesus began His earthly ministry, was a total of 483 years. Interestingly, if you use the Jewish calendar which has a 360-day lunar year, the time would be near the very crucifixion of Jesus Christ at approximately A.D. 33. Which is right? The Jewish calendar reckoning or the one we use today? In the last part of Gabriel’s message to Daniel, he says “And he shall make a strong covenant with many for one week, and for half of the week he shall put an end to sacrifice and offering. And on the wing of abominations shall come one who makes desolate, until the decreed end is poured out on the desolator” (Dan 9:27) and there are some theologians that believe it the “he” of “he shall make a strong covenant” is the “anointed one” who put an end to sacrifice by His once-and-for-all supreme and sufficient sacrifice of His own life and blood. That was the offering; of Himself. The covenant is the New Covenant that Jesus initiated on the night that He was betrayed. It was His own body and blood that is the seal of this covenant and established the Lord’s Supper or Communion. Some believe that this one who makes desolate by his abomination is the “prince who shall destroy the city” but that was Emperor Titus that did that. Yet others feel that the “prince” is the Antichrist who will establish a covenant with the regathered Jewish people in the land of Israel but this covenant will only be for a time (Dan 12:1; Matt 24:21; Rev 7:14) and this prince will put an end to the sacrifice that some believe will begin again. Although it’s not unimportant, whatever you believe about the seventy-weeks doesn’t put you at risk of losing your salvation if you don’t understand it all. Just like the Book of Revelation, the Book of Daniel is still somewhat of an enigma. Thankfully, the main things are the plain things as God makes it simple enough for a child to understand how to be saved yet deep enough to drown many a scholar. The simplicity of the gospel is that a person must humble themselves before God, confess their sins, repent of them (which means change your mind about sin and agree with God), and then trust in Christ as your personal Savior. You don’t need a Bible degree to know how to be saved because God “commands all people everywhere to repent” (Acts 17:30). Previous post: How Was Jesus Described in the New Testament? Next post: What Does The Bible Teach About Prisoners?